Audio Spotlight directional sound technology was employed to deliver the story of nature at the Understory visitor center, located inside The Spheres conservatories on the campus of Amazon's headquarters in Seattle. Understory is a free public visitor center where guests can learn about Amazon and The Spheres. With interactive exhibits focused on flora, natural habitats, and design, the self-guided Understory exhibit provides an immersive, 360-degree experience to visitors through visual displays and spoken narratives that are beamed by Audio Spotlight speakers. 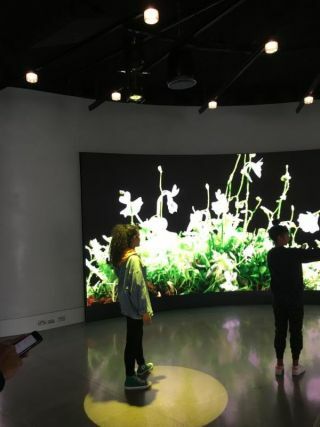 The integration of Audio Spotlight at Understory was implemented by audio visual designer and integrator Whitlock and media experience designer Belle & Wissell. At the exhibit, four AS-24i Audio Spotlight speakers produce narrow beams of sound, ensuring that each audio narrative is contained to specific spots in the large, open room. This characteristic of Audio Spotlight is perfectly aligned with the Understory exhibit as patrons are immersed in a light beam (photos on right) when they step into the spot that triggers an audio narrative. On any given day, visitors of all ages from students, local urbanites, and tourists can be seen in utter enticement as the light beams douse them in light and Audio Spotlight envelops them in sound. Featuring a thin design with a built-in amplifier, and comprised of a compact overall package, the ceiling-mounted Audio Spotlight speakers create a seamless integration at this unique and popular exhibit. Amazon initially developed the idea for The Spheres to establish an innovative, horticulturally rich setting that would provide an experience for its employees that's typically absent in an urban office setting—a direct link to nature. From its inception in 2013 to its grand opening in January 2018, many businesses throughout the Pacific Northwest collaborated to make the project possible. Today, The Spheres are home to over 40,000 plants from the cloud forests of over 30 countries. The Audio Spotlight speakers at the exhibit deliver sound to tight, narrow areas, just like spotlights. This spotlight effect results in sound levels dropping by over 90 percent, even just a single step outside the narrow beam of coverage, making them well suited to a variety of applications that include museums, galleries, showrooms, and other exhibits, to kiosks, digital signage, retail displays, and creative OOH advertising.